Background: The capacity of the plantar sole of the foot to convey information about foot position is reduced by conventional smooth boot insoles, compared with barefoot surface contact. Methods: An automated testing device, the ankle movement extent discrimination apparatus (AMEDA), developed to assess active ankle function in weight bearing without a balance demand, was used to test the effects of sole inserts in soccer boots. Seventeen elite soccer players, the members of the 2000 Australian Women’s soccer squad (34 ankles), took part in the study. Subjects were randomly allocated to start testing in: bare feet, their own football boots, own football boot and replacement insole, and on the left or right side. Subjects underwent six 50 trial blocks, in which they completed all footwear conditions. The sole inserts were cut to size for each foot from textured rubber “finger profile” sheeting. Results: Movement discrimination scores were significantly worse when subjects wore their football boots and socks, compared with barefoot data collected at the same time. The substitution of textured insoles for conventional smooth insoles in the football boots was found to restore movement discrimination to barefoot levels. Conclusions: The lower active movement discrimination scores of athletes when wearing football boots with smooth insoles suggest that the insole is one aspect of football boot and sport shoe design that could be modified to provide the sensory feedback needed for accurate foot positioning. Many sports involve activities that place high physical demands on the lower limbs, and injuries to the knee, foot, and ankle are common. A prospective study of 10 393 basketball playing episodes found an overall injury rate of 18.3 per 1000 participations, with the ankle joint the most common serious injury site.1 Data collected using soccer players showed that knee and ankle injuries represented 71.4% of lost match time for one Australian National League soccer team.2 Aspects of footwear have relevance to injury research, but other than as a shock absorber, the potential role of the sport shoe as an interface between the moving body and the support surface has received little attention in the sports medicine literature. As the point of contact in this interface, the plantar sole is important. Further evidence for the role of the sensory information arising from the sole of the foot in posture control comes from patients with diabetic neuropathy, which has resulted in loss of plantar cutaneous sensation.9 For patients with reduced sensitivity after microvascular free flap reconstruction, the amount of body sway was found to be increased compared with normals, and sway was related to the size of the affected skin region.10 In their study of older adults with moderate plantar sensitivity, Maki et al11 investigated special footwear insoles, which they designed to reduce instability and risk of falling in these patients. They found stabilising reactions to be facilitated from a segment of flexible polyethylene tubing taped to the boundary of the plantar surface of the foot. However, an easier to use form of stimulation is a modified shoe insole. If the plantar sole of the foot reflects changing pressure patterns and thus provides important information about the disposition and movement of the body’s centre of mass, then this capacity is masked to some extent by footwear. With few exceptions, one of the principles of construction for both athletic and ordinary footwear has been to provide a smooth insole to contact the plantar sole. Associated with this has been the development of increased shock absorption by the shoe sole, sometimes by the inclusion of new synthetic materials and air or gel cells.12 When combined with the ubiquity of smooth walking surfaces, the result is a substantial reduction in the stimulation to the plantar sole. Some researchers have, however, documented the negative effects of this trend. Stacoff et al13 found significant foot slip within court shoes during a cutting manoeuvre. Less information about foot movement in relation to the shoe therefore would seem to be worse for maintaining balance,13 and Robbins et al14 have likewise argued that less information about foot position is worse for maintaining balance. Consistent with this view, McKay et al15 found that more injuries occurred when there was a greater degree of cushioning and shock absorption in the sole of basketball shoes. It can be argued that the effects of reduced information available from the plantar sole are not critical in landing from a jump (where the time needed to adjust foot angles is too great to prevent injury once ground contact has been made) but are critical in terms of foot carrying angle in swing phase. Foot carrying angle during swing is important for maintaining clearance and in preparing foot posture for the next ground strike. Crosbie and Ko16 have shown that, when stepping over a kerb under natural environmental conditions out of doors, accurate planning for obstacle avoidance occurs some distance before the obstacle is reached. A similar mechanism may operate for walking, running, and changing direction on smooth surfaces. If inversion, plantarflexion, and rotation angles during swing phase are set relative to the perceived angles from the previous stance phase, then proprioceptive error could accumulate to the point where the position of the foot and ankle at the start of stance results in excessive motion and injury (fig 1). Chen and coworkers17 have shown that a relatively small change in the angulation of the foot and ankle significantly increases the risk of catching the ground (tripping) during the swing phase of gait. From this research, they have computed the increase in trip probability contingent upon increases in the error associated with inversion and plantarflexion foot carrying angles during swing phase. If the trajectory of the swinging leg is represented graphically, as in fig 2, the optimum swing trajectory can be described as the peak of a normal distribution. A still sequence of an ankle injury occurring to a professional tennis player. The left foot posture represents an example of how movement control parameters set at toe off influence the following foot strike. Frame 1, starting left foot toe off; frame 2, tip of left foot catching the ground after toe off; frame 3, early swing phase; frame 4, starting left foot strike; frame 5, uncontrolled left inversion/plantarflexion. Diagrammatic representation of the limb trajectory in swing phase of gait, where the optimum swing trajectory can be described as the mean of a normal distribution of swing heights. If the leg is swung higher than the optimum trajectory, there would be little risk of tripping, but the energy cost would be greater. If the leg is swung lower, the risk of tripping or a less controlled heel strike is greater. Clearly, if the leg is swung higher than the optimum trajectory, there would be little risk of tripping, but the energy cost would be greater and the movement inefficient. However, if the subject is less able to approximate the optimum swing trajectory—that is, has more error in the positioning of the swing leg, or more error in the position of the foot at toe off—then the subject’s leg may swing lower. Accordingly, the risk of tripping or a less controlled foot strike is greater, and the potential for injury increases. To achieve optimum stimulation at footfall for providing the information base from which foot carrying angles during swing are set, a greater amount of plantar sole stimulation than that arising from smooth insoles would be beneficial. If it were possible therefore to enhance information from the plantar sole, one effect of this should be to improve sensitivity to different extents of ankle inversion. We based our selection of insole on the findings of Watanabe and Okubo7 that a plate containing embedded protruding “shot gun pellets” at 1 cm centres produced a significant effect on balance task performance. A compliant material was sought with nodules similar in size to the Watanabe and Okubo shotgun pellets, which could be cut and inserted into the athlete’s shoe. 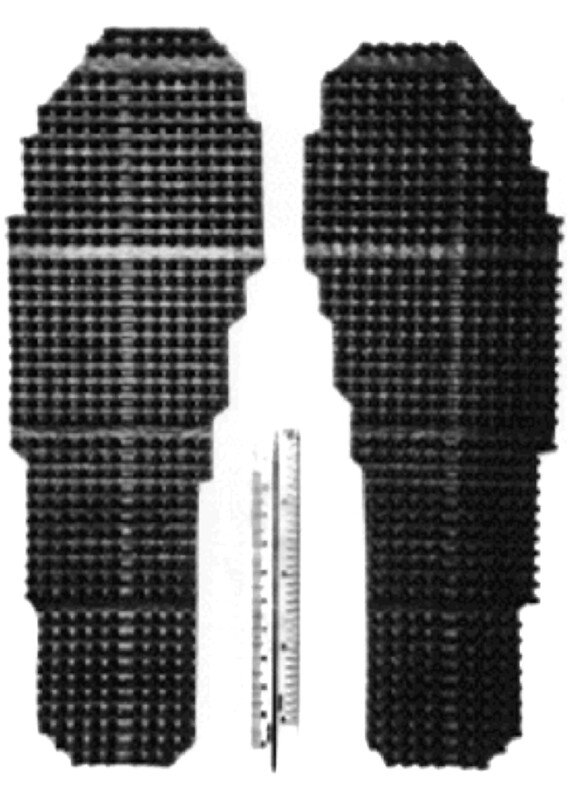 The nearest commercially available material to the size of the pellets described was a rubber sheeting, with four nodules (3 mm high and 1 mm diameter) per square centimetre (the “finger profile”; Clark Rubber, Stacey Street, Bankstown, Australia). Previous research on this topic found a significant decrement in ankle movement discrimination in elite netball players when wearing sport shoes as compared with bare feet.18 Other authors have suggested that aspects of modern sport shoe design may contribute to some lower limb injuries.15,19,20 Within this context we have considered the football boot as an environmental buffer modifying the function of the lower limb complex.21 To test changes to football boots, however, requires a lower limb functional test. The concept of using whole motor tasks (functional movements) in injury rehabilitation and as a means of assessment of recovery of function is well established in the therapeutic literature.22 To test the effects of football boots on the making of functional movements, an apparatus and methodology appropriate to the model was needed. Accordingly, an automated testing device, the ankle movement extent discrimination apparatus (AMEDA), which has been developed to assess active ankle function in weight bearing, but without a balance demand, was used in this study to test the effects of textured sole inserts in soccer boots.23 Because balance scores are related to subject height,24 mean movement discrimination score was correlated with height as a check on balance involvement. Twenty two elite soccer players, the members of the 2000 Australian Women’s soccer squad, enrolled in the study. Five were excluded because of an existing injury. No participating subject reported any history of musculoskeletal injury to the lower limb or back or any ankle pain in the six weeks preceding the study, nor had any history of visual or vestibular disturbance affecting balance. Final testing was undertaken on 17 subjects (34 ankles) (mean (SD) age 24 (5) years, height 168 (7) cm, and weight 63 (7) kg). Twelve subjects preferred the right foot for kicking, five were left foot kickers, and one had equal preference for both sides. The project was approved by the human ethics committee of the University of Sydney, and each subject signed a consent form. The AMEDA was used,25 as it provides discrimination scores representing subjects’ sensitivity to small differences in extent of ankle inversion. It provides a method of assessing lower limb active movement function that fulfils the validity criteria described by Ashton-Miller26—that is, a weight bearing position, functional movement velocities, and adequate trials to assess a subject’s ability to discriminate movement extent.26 The device consists of a swinging plate which rotates about an axle under the long axis of the foot being tested (fig 3). While standing astride, with one foot on a fixed plate and the foot being tested on the movable plate, subjects make an active inversion movement which moves the plate and the outer side of the foot down until contact is made by the rim of the plate on an adjustable metal stop. They then return the plate to the horizontal stopped position at the same steady pace, and make a judgment as to the extent of inversion. (A) Subject standing on the ankle movement extent discrimination apparatus (AMEDA) platform. (B) Subject making an active inversion movement which moves the plate and the outer side of the foot down until contact is made by the rim of the plate on an adjustable metal stop. Subjects were randomly allocated to start testing in: bare feet, their own football boots, own football boot with experimental insole, and on their left or right side. Whenever boots were worn, team socks were also worn. Subjects underwent six 50 trial blocks on the AMEDA, in which they completed all footwear conditions. The sole inserts were cut to size for each boot from the textured finger profile rubber sheeting described above (four nodules/cm2) (fig 4). This density is greater than commercially available “massage” sandals. To establish that this material could be worn as insoles during testing, the first author wore a pair in conventional work shoes for a week without discomfort. Rubber matting purpose cut to serve as textured insoles. With their feet placed shoulder width apart, subjects were asked to stand in a relaxed posture on the platform of the AMEDA (about 50 cm above the floor) with the foot of the limb being tested centred over the axis of movement of the movable base plate. The psychophysical method used was that of absolute judgments, where there were five possible stimuli and five possible responses. Each subject was given a brief series of trial movements to familiarise them with the feel of the plate at each of the inversion distances, before data collection. The five inversion extent stimuli were then presented 10 times in random order, with no feedback being given as to the correctness of the numerical response made after each movement. Only one completed attempt at each movement was allowed, and subjects were asked to move down to the inversion stop, then back up to the horizontal stop at a steady pace. After making the movement they were asked to give the number that they felt represented the stop. A laptop computer was used to set the vertical stops for each downward movement, and the experimenter manually recorded the subject’s response. Raw scores were collated, and cast into 5 × 5 matrices representing the frequency with which each response was used for each stimulus—for example, the number of times a “2” was used when stimulus 1 was presented. Thereafter non-parametric signal detection analysis was used to generate pairwise receiver operating characteristic curves.27 Mean area under these curves was used as the discrimination score with a possible maximum of 1.0 for perfect discrimination and 0.5 representing chance responding (fig 5). A 2 × 2 analysis of variance was conducted on these data, with the first factor being the side of the foot tested (left or right) and the repeated measures factor being shoe condition (bare foot or boot or boot and textured insole). Mean discrimination score (area under the curve) plotted against footwear condition. Whisker bars represent standard error. 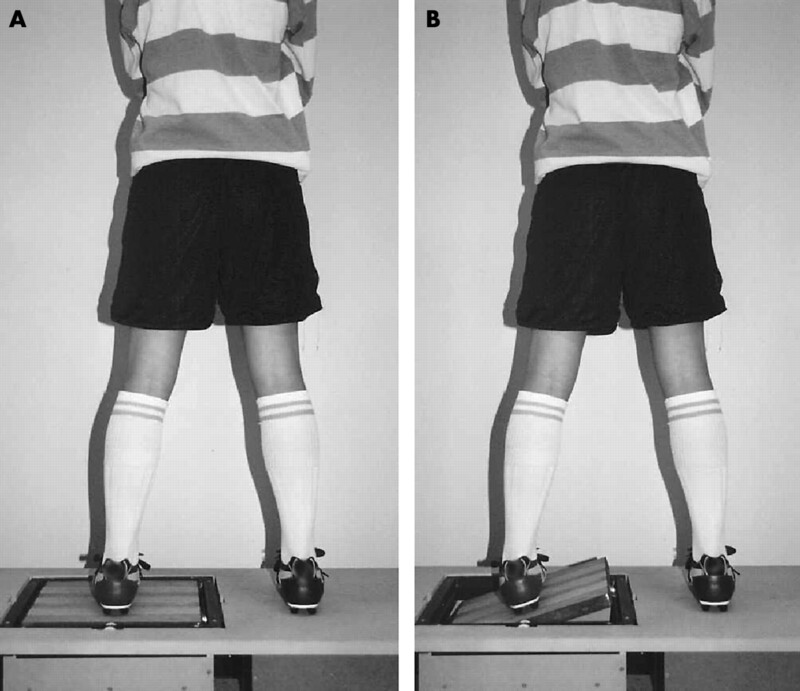 Table 1 presents the mean scores (× 100) for inversion movement discriminability for the right and left ankles under each of the testing conditions. To examine these data, contrasts were written within a repeated measures analysis of variance.28 Movement discrimination scores were significantly worse when subjects wore their football boots and socks, as compared with the data from the barefoot condition collected during the same session (F1,16 = 6.68, p = 0.02). The substitution of textured insoles for conventional smooth insoles in the football boots significantly improved discrimination (F1,16 = 5.00, p = 0.04). Although there was no overall effect of side, there was a side-footwear interaction effect whereby left foot scores were better when barefoot, and right foot scores were better in the two boot conditions (F1,16 = 9.66, p<0.01). When the scores under the two boot wearing conditions (insole/no insole) and the two sides (left/right) were examined in a separate 2 × 2 analysis of variance, there was a significant advantage associated with wearing textured insoles (F1,16 = 5.00, p = 0.04) and from using the right foot during testing (F1,16 = 8.49, p = 0.01) but no interaction (F1,16 = 0.20, p = 0.66), indicating that the insoles improved discrimination equivalently for the left and right sides. A textured insole increases movement sensitivity. Modification of the foot/shoe interface at the insole may be a method of reducing lower limb injuries in sport. Chen and coworkers17 have shown that the mean foot/ground clearance in normal swing is 20 mm, and the probability of striking a 25 mm step is 1.2%. A 1° increase in plantarflexion may reduce ground clearance to 16 mm; similarly an increase in inversion of 1° further reduces clearance to 14 mm, and the probability of striking a 25 mm step increases to 6%. 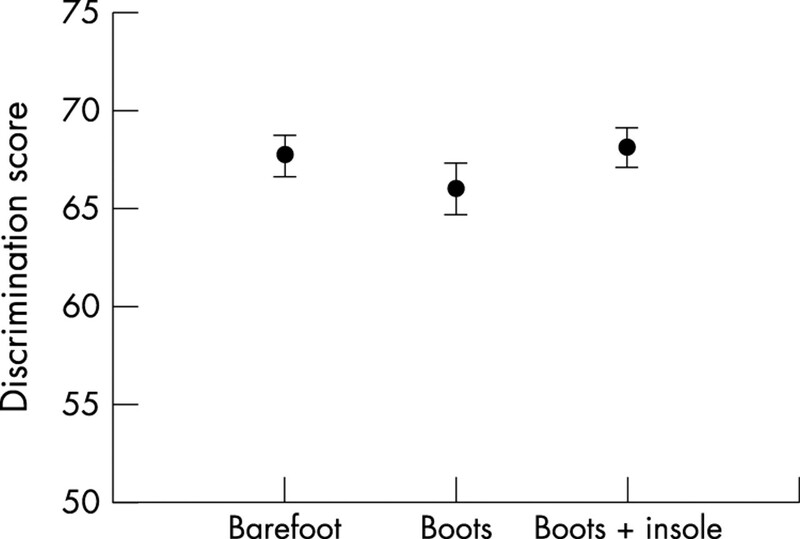 The results of our study represent a 1.1° inversion range of uncertainty in the barefoot condition, increasing to 1.14° when boots were worn. This 0.04° of increased inversion uncertainty potentially increases frequency of tripping from 1.2% to 1.22%. Although this 0.02% increase in frequency of tripping resulting from wearing soccer boots appears small, when considered over the large number of gait cycles undertaken in playing and training it may become an important factor in contributing to injury incidence, and is therefore worth ameliorating with an insole change. Independent of the textured insole effect, we observed an interaction between the foot being tested and whether or not boots were worn. When subjects were barefoot, the data here replicated the left foot superiority found by Carnahan and Elliott31 with a foot positioning task, which their subjects also performed barefoot and without visual information. Such an effect in a foot positioning task replicated earlier results in manual positioning32 and has been interpreted in terms of the superiority of the right cerebral hemisphere in spatial tasks.33 The effect of wearing boots, however, was to reverse the side advantage, so that the right foot (the preferred kicking foot for most subjects) showed better movement discrimination scores. Experience at a task while wearing shoes creating an advantage over performance when barefoot has been put forward by Robbins et al19 to account for the poor barefoot performance (compared with when shod) that they observed in subjects who were over 70. It is possible that task specific experience could also account for the reversal in left foot-right foot performance observed here when going from the barefoot to the shod condition. Further research is warranted on the factors that determine whether performance will be better wearing shoes or when barefoot. The ability of the insole to assist in restoring the subjects’ ability to discriminate inversion movements to the same degree as when barefoot suggests that modifying the sole of the foot/shoe insole interface may provide an avenue for further reducing lower limb injuries in sport. The costs of relying on cushioning and comfort in athletic shoe sole manufacture have been documented previously.19 Future work is needed to establish the amount of texture that is compatible with extended running or sporting activity without discomfort while maintaining improved discrimination of movements into inversion. We would like to acknowledge the contribution of the Coach Chris Tanzey and the members of the Australian Women’s Soccer Team 2000. McKay G, Goldie P, Payne W, et al. A prospective study of injuries in basketball: a total profile and comparison by gender and standard of competition. J Sci Med Sport2001;4:196–211. Royal Australasian College of Surgeons. Injury patterns in soccer. Football Australasia: reducing the injury list. Melbourne: Royal Australasian College of Surgeons, 1998. Geldard F. The human senses. 2nd ed. New York: John Wiley and Sons, 1972. Jones F. Arboreal man. 3rd ed. London: Edward Arnold & Co, 1926. McKie R. Dawn of man, the story of human evolution. 1st ed. London: Dorling Kindersley Publishing, 2000. Kekoni J, Haemaelaeinen H, Rautio J, et al. Mechanical sensibility of the sole of the foot determined with vibratory stimuli of varying frequency. Exp Brain Res1989;78:419–24. Watanabe I, Okubo J. The role of plantar mechanoreceptors in equilibrium control. Ann N Y Acad Sci1981;77:855–77. Kavounoudias A, Roll R, Roll J-P. The plantar sole as a “dynamometric map” for human balance control. Neuroreport 1998;9:3247–52. Van Deursen R, Simoneau G. Foot and ankle sensory neuropathy, proprioception and postural stability. Journal of Orthopaedic and Sports Physical Therapy1999;29:718–26. Haemaelaeinen H, Kekoni J, Rautio J, et al. Effect of unilateral sensory impairment of the sole of the foot on postural control in man: implications for the role of mechanoreception in postural control. Hum Mov Sci1992;11:549–61. Maki B, Perry S, Norrie R, et al. Effect of facilitation of sensation from plantar foot-surface boundaries on postural stabilization in young and older adults. J Gerontol1999;6:M281–7. Nigg B. The role of impact forces and foot pronation: a new paradigm. Clin J Sports Med2001;11:2–9. Stacoff A, Reinschmidt C, Stussi E. The movement of the heel within a running shoe. Med Sci Sports Exerc1992;24:695–701. Robbins S, Waked E, McClaren J. Proprioception and stability: foot position awareness as a function of age and footwear. Age Ageing1995;24:67–72. McKay G, Goldie P, Payne W, et al. Ankle injuries in basketball: injury rate and risk factors. Br J Sports Med2001;35:103–8. Crosbie J, Ko V. Changes in temporal and distance parameters of gait evoked by negotiation of curbs. Aust J Physiother2000;46:103–12. Chen H-C, Ashton-Miller J, Alexander N, et al. Stepping over obstacles: gait patterns of healthy young and old adults. J Gerontol1991;46:M196–203. Waddington G, Adams R. Textured insole effects on ankle movement discrimination while wearing athletic shoes. Physical Therapy in Sport2000;1:129–36. Robbins S, Waked E. Hazards of deceptive advertising of athletic footwear. Br J Sports Med1997;31:299–303. Bartold S. The football boot, saint or sinner? Football Australasia: reducing the injury list. Melbourne: Royal Australasian College of Surgeons Conference, 1998. Nigg B, Nurse M, Stefanyshyn D. Shoe inserts and orthotics for sport and physical activities. Med Sci Sports Exerc1999;31:S421–8. Carr J, Shepherd R. A motor learning model for rehabilitation. In: Carr J, Shepherd R, eds. Movement science: foundations for physical therapy in rehabilitation. Rockville, MD: Aspen Publishers Inc, 1987. Waddington G, Adams R. Discrimination of active plantarflexion and inversion movements after injury. Aust J Physiother1999;45:7–13. Balogun J, Akindele K, Nihinlola J, et al. Age related changes in balance performance. Disability and Rehabilitation1994;16:58–62. Waddington G, Adams R, Jones A. Wobble board (ankle disc) training effects on discrimination of inversion movements. Aust J Physiother1999;45:95–101. Ashton-Miller J. Proprioceptive thresholds at the ankle: implications for prevention of ligament injury. In: Lephart S, Fu F, eds. Proprioception and neuromuscular control in joint stability. Champaign: Human Kinetics, 2000:279–89. McNicol D. A primer of signal detection theory. London: Allen and Unwin Pty Ltd, 1972. Winer B, Brown D, Michels K. Statistical principles in experimental design. 3rd ed. New York: McGraw-Hill Book Company, 1991. Robbins S, Gouw G. Athletic footwear: unsafe due to perceptual illusions. Med Sci Sports Exerc1991;23:217–24. Robbins S, Waked E, Rappel R. Ankle taping improves proprioception before and after exercise in young men. Br J Sports Med1995;29:242–7. Carnahan H, Elliott D. Pedal asymetry in the reproduction of spatial locations. Cortex1987;23:157–9. Roy E, McKenzie C. Handedness effects in kinesthetic spatial location judgements. Cortex1978;14:250–8. Fagot J, Lacreuse A, Vauclair J. Roles of sensory and post-sensory factors on hemispheric assymetries in tactual perception. In: Christman S, ed. Cerebral asymmetries in sensory and perceptual processing. London: Elselvier Science, 1997:469–94. This paper adds to the growing body of literature highlighting the importance of psychophysical feedback loops in efficient foot and lower leg function. Sensory feedback is now seen as one of the most important requirements for accurate foot positioning, and is an area of intense interest in athletic footwear design and falls research. This study emphasises the ability of a relatively simple intervention to positively influence athletic performance. The researchers may now like to consider further investigating the role of the dimpled shoe insoles in a more functional sporting task setting.